While the 2015 rig-up deadline of the morning of June 12th is a ways away, it will take all of the remaining time to get the job done. The spars still “on-the-hard” are now cosmetically finished. Some are ready to come directly aboard. Some require “dressing” prior to coming aboard. It looks like those spars ready to come aboard will start being brought aboard later this week. Helpers anyone? Email me at jan@pride2.org. We’d be happy to have your help. The peak and throat halyards of the fore and main masts are finally in position today. We had a set-back yesterday. Incomplete labeling and mislabeling labeling from last year’s down-rig caused the new crew to install one of the throat halyards on the incorrect mast. This occurred by reason of fishing out of storage one lower mast halyard at a time. 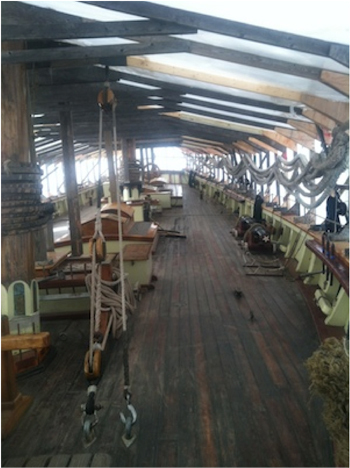 (You can see in the pictures how big and complicated these halyards are and also they are equipped with jigs…a separate block and tackle system at one end of the actual halyard used for greater mechanical advantage to do finer adjustments of stretching the sail or adjusting it’s shape). Last week the throats and gant-lines went up on the lower masts. Yesterday while putting up the peak halyards it was discovered one of them was labeled as a throat halyard. Long story short…a guess was made that it was actually the peak for the main. Nope. Too short. 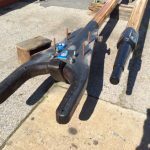 After a lot of checking in listed descriptions of parts of the rig it was found the throat halyard on the foremast was actually the main peak halyard. This meant the wrong main peak halyard had to be taken down. The wrong foremast throat halyard had to be taken down. Then both shifted and finally put in their correct locations. Then finish by putting up the fore peak halyard. Ugh! I figure we lost a half day. The lower mast wedges are driven into place and the mast boots prepped (see photos) for installation tomorrow. The rest of this week it is expected we will start dressing the yards and coordinate shifting topmasts aboard for staging on deck to be sent up into position. Who wants to help shift topmasts aboard and hoist them up? When might you be available? Please contact me at jan@pride2.org. Our sincerest thanks. CAPTAIN'S LOG: Help us dress and move the spars! Help us dress and move the spars! The fine weather of today and forecast thru the weekend after the recent, all-day rain on Thursday is an opportunity to jump onto the last of the cosmetic protection of the spars in anticipation of moving them aboard later next week so they can be rigged into sailing position. The varnish was done in January and February. Once this final bit of protective coating is completed…”dressing” of the spars will commence this weekend and first part of next week before the spars start going aboard. Dressing is the moniker referring to putting any rigging that is fixed to the spars before being rigged into place aboard the ship. Anyone looking to give a hand…come on by. Email me, Captain Miles, at jan@pride2.org. Especially the later part of next week for the moving of spars aboard in preparation of rigging into place. Remember, many hands make light work! For the moving of the spars…the more hands…the lighter the moving of the spars will be. Come when you can. Go when you must. We are here every day working from 8 AM to 5 PM. We have great food provided by Kevin Moran! We thank you for your help! Pictured above: PRIDE thanks all of the volunteers that came Saturday to assist. Captain Herard and 3 crew from LADY MARYLAND, Pride, Inc.’s own office and ship volunteer Pierre Henkart, PRIDE alum crew Brad Fluery, Christine Clear, Doug Leasure, Paul Powachroski, Chris Landers, new to the ship volunteer Phil Wieser, Winter Crew Volunteer Alum Steve Valihura and four Ship’s Officers, Jesse Doucette, Zach Michael, Dan Calbick and Kevin Moran. Not shown in the photo is new to the ship volunteer Richard Heckart who assisted on Friday. In the first week of Rig-Up 2015, the ship has been made livable and she has been unwrapped and de-framed… meaning her winter cover has been moved from ship to shore and stowed away till next time we lay the ship up for winter. Now begins the process of moving further aboard with PRIDE’s equipment and safety gear while also preparing to actually send topmasts and yards up. It will be at least a week before even considering sending topmasts up. They must be dressed. The usual running rigging blocks for halyards to lift topmasts up must first be sent up and rove off with halyards. Meanwhile the yards must also be “dressed” with their own blocks and rigging in preparation of being sent up. Anyone up for the fiddly details of getting equipment aboard and stowed properly as well working on preparing for sending yards and topmasts up? Email Captain Jan Miles at jan@pride2.org. On Monday, May 11, the first of our new 2015 sailing season’s crew came aboard Pride of Baltimore II! The ship has been residing at her winter berth on Clinton Street in Baltimore. The crew is already hard at work converting her belowdecks to a habitable state. Pride’s winter cover had been shielding the idle ship from direct sunlight and rain. One of the most important factors in preserving a traditionally wood constructed vessel like Pride is good ventilation. Also, some of the ship’s hotel services, like running water, were turned off. I am proud to introduce our new crew: 1st Mate Jesse Doucette, Bosun Daniel Calbick and veteran cook and Pride shipmate Kevin Moran, who have already come aboard for the conversion. 2nd Mate Zach Michael will join us as soon as he can from the coastal delivery of Sail Training Vessel (SSV) GERONIMO he has been on from Charleston, SC to Newport, RI. That delivery was interrupted by the early season tropical depression Ana rattling around off the southeast coast, making it untenable for remaining at sea along that coast. Kindly, Captain Tony Arrow has set Zach free to join Pride, possibly as soon as next week. I don’t know when the remaining officer will come aboard. We are still looking for a sailing mechanic we call Engineer/Deckhand. If you have prior traditional working sail vessel experience and are interested, please email me, Captain Jan Miles, at jan@pride2.org. All interested applicants must be U.S. citizens and either be prepared to prove being drug-free, as per USCG regulations, or meet the regulations for being qualified as drug-free. I am also in search of a few more volunteers. It is my hope that converting the live-aboard situation will proceed with reasonable speed so that we can then clean the deck and prepare it for a coat of oil by the end of next week. If you are available to lend a hand next week, we would love to have your help! After the deck oiling, the next step before actual rig-up can begin is to get the ship’s winter cover and frame off the ship and stored ashore, as well the cover and frame that we call “Sparlandia,” an onshore, Quonset-hut like cover to Pride‘s topmasts, gaffs, yards and boom stored ashore. We are looking for volunteers to assist with this dis-assembly on Saturday, May 16 and Sunday, May 17. Email jan@pride2.org if you are available. Many hands make light work… you all might know this well. Pride‘s officers will appreciate greatly any and all assistance! After many months of planning, I am thrilled to announce that Pride of Baltimore II will be sailing this year! We have named our 2015 season campaign Baltimore: Home Port of the Brave, which could not be a more fitting title. 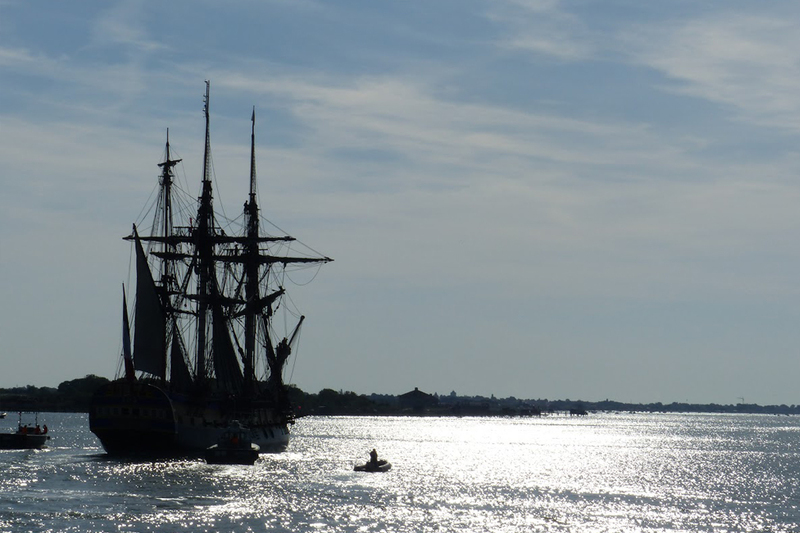 Over the years, Pride has voyaged to ports around the world in order to participate in tall ship festivals and other War of 1812 Bicentennial events. But this year, Pride‘s main focus will be Baltimore. We are thrilled to celebrate her rich heritage with the citizens of her namesake town. It’s a responsibility we take very seriously, especially in light of the city’s recent unrest. Pride herself is emblematic of the very best characteristics of Baltimore, such as the city’s entrepreneurial spirit, its rich history and its technological prowess, and we look forward to showcasing this to you. Pride‘s 2015 sailing season will run from mid-June thru October. You will have the opportunity to participate in the unique and historical experience of stepping aboard a topsail schooner through our interpretive dockside tours, as well as day sails, private charters, and overnight guest crew opportunities. Pride will be docked at the Inner Harbor and will be open for deck tours and a limited number of day sail opportunities between Wednesday and Sunday. A complete schedule of Pride‘s activities is currently being planned; please check our Pride of Baltimore II website for updates. In addition, we will be sending you a schedule of activities in our next issue of the Sail Mail, starting with Pride’s official launch date in June. So stay tuned! Join the Port of Baltimore community as we celebrate National Maritime Day on Sunday, May 17 from 10 am – 3 pm at Pier 13 in Canton! (4601 Newgate Avenue, Baltimore, MD 21224). This is a FREE event showcasing the companies and careers that make the Port of Baltimore the economic heart of Maryland. This is your chance to tour the Nuclear Ship Savannah – and you can even board the way passengers did back in the ship’s heyday. In total, there will be sixteen visiting vessels and craft. You will also have the opportunity to tour the coal terminal Consol Energy/CNX Marine Terminal and see a display of LEGO model ships. While Pride of Baltimore II will be busy preparing for her summer sailing season, she will be represented with an informative table and giveaway prizes, so be sure to check us out. In addition, McAllister Towing and the Baltimore City Fire Boat will supply a water cannon salute at the conclusion of the National Maritime Day Commemoration. Parking is free and available on Newkirk Street, Newgate Avenue, Leland Avenue and Pier 12. A free parking shuttle van will take visitors to and from the festivities. For complete details and directions, visit the www.portfestbaltimore.org website. See you there! May 14 was a day of remembrance for all Pride sailors, as we observed the loss of the original Pride of Baltimore and four of her crew in a microburst squall off Puerto Rico in 1986. Since her construction in downtown Baltimore and launch in 1977, Pride had sailed over 150,000 miles, covering the American east and west coasts, Europe, and the Caribbean. In those 9 years, Pride had demonstrated the superb sailing performance and beauty of the Baltimore clippers of the early nineteenth century. During her nine years at sea, Pride captains and crew extended the hand of friendship to thousands of people throughout the world. Pride II was commissioned in 1988 as a sailing memorial to her predecessor. Congratulations to everyone who correctly answered our last Trivia question! A “weather gage” refers to the windward position of one of two sailing ships in combat, conveying more opportunities in maneuvering into favorable positions for cannon fire. The British HMS St. Lawrence had the “weather gage,” as it was upwind of Chasseur as identified by the sails of both ships.